At first glance this appears to be a family portrait complete with realistic details of middle-class English decor. In fact, it is a staged scene of domestic harmony, celebrating the end of the Crimean War. The father, a wounded officer, holds a copy of the Times announcing the war's end. One daughter clasps his combat medal. On the mother's lap, four animals from the toy Noah's Ark represent the four belligerents: Britain (lion), Russia (bear), the Ottoman Empire (turkey), and France (rooster). The girl at the left holds a dove with an olive branch in its beak, a symbol of peace. 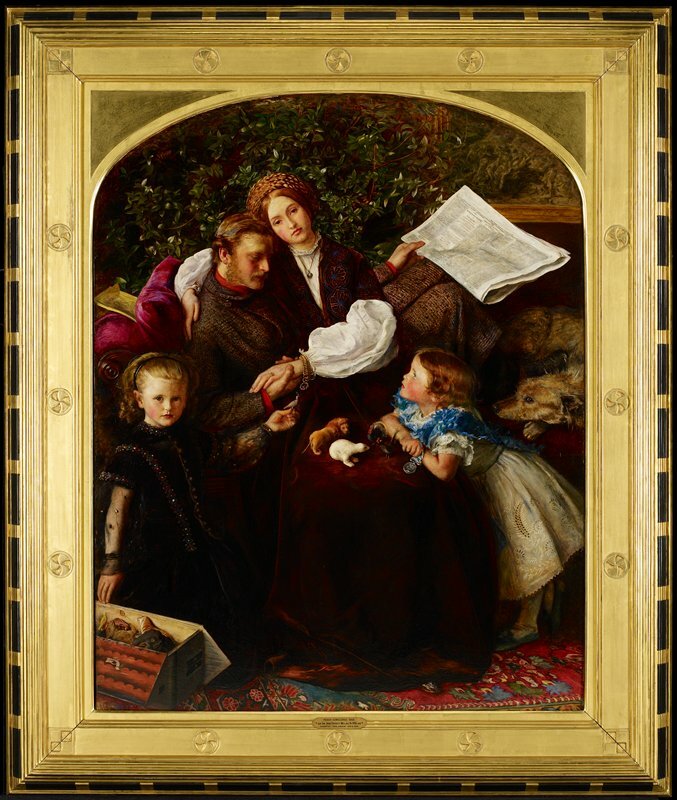 Millais belonged to a group of English painters called the Pre-Raphaelite Brotherhood. Their work emphasized close observation of nature and the depiction of contemporary events.